A top American general says that 100 would-be militants have already left small Caribbean countries to fight with Islamic State extremists in Syria – and could potentially get across the US border when they return home. Marine Gen. John F. Kelly, chief of the US Southern Command, made the remarks at a Pentagon briefing with reporters on Thursday. He said that small Caribbean nations – such as Jamaica, Trinidad and Tobago, and Suriname – as well as Venezuela are concerned about the militants returning home to conduct terror operations because they don't have the ability to deal with the problem. The general said that while the number of people leaving to fight alongside militants is small, the US takes for granted a functioning legal justice system, the FBI, and layers of clean police officers – which may absent in some of the Caribbean countries. When recruits return, he said, they can’t be monitored or checked. 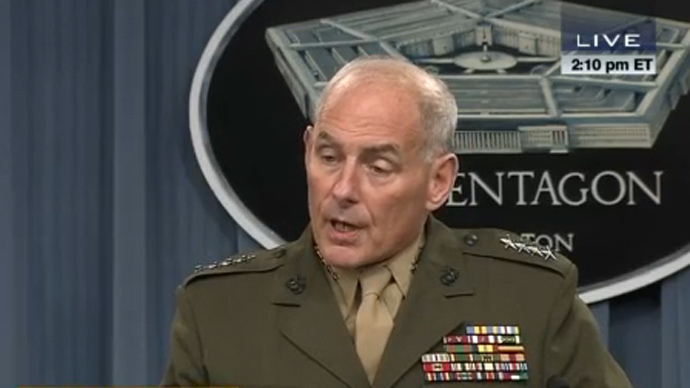 Once back in their country, Kelly said the recruits could travel freely between nations and potentially get across the border into America. "Everyone is concerned, of course, if they come home," said Kelly, adding that in Syria the recruits would "get good at killing and pick up some real job skills in terms of explosives and beheadings and things like that." Kelly told reporters the sophistication of, and the amount of movement going through, the smuggling networks through the isthmus and Mexico overwhelms “our ability to stop everything” via the US Border Control and the Department of Homeland Security. But he said he has seen no indication of a direct threat or scheme to attack the US. More than 15,000 foreign fighters have traveled into the Middle East to join the Islamic State, according to the Washington Post. In remarks made before the Senate Armed Services Committee in advance of the committee’s review of the Defense Authorization request for fiscal year 2016, Kelly described the effects that a return of sequestration would have on his command. “In Latin American, in Southern Command [sequestration] will be, simply put, a castastrophe. It will essentially put me out of business,” Kelly told the panel. Kelly said his area of responsibility is in narco-terrorism, human smuggling, and the spreading influence of criminal networks which are threats to Latin America, the Caribbean, and the United States itself. “The drug trade, exacerbated by US drug consumption, has wrought devastating consequences in many of our partner nations, degrading their civilian people and justice systems, corrupting their institutions, and contributing to a breakdown in citizen safety,” Kelly said in a written testimony. Kelly said terrorist organizations could try to leverage the same smuggling routes to move operatives who intend to harm US citizens or bring weapons of mass destruction into the United States.